Volkswagen claims its ‘new’ Crafter light commercial has been designed ‘without compromise’. It will be available up to 5.5 tonnes. The new Crafter (below) will be available from November onwards with the present powertrains supplemented from mid-2017 by the 4MOTION all-wheel drive system with a transversely mounted engine and the rear-wheel drive system with a longitudinally mounted engine. In the front-wheel drive version, Crafter now offers a maximum cargo capacity of 18.4 m3 with a permissible gross weight of 3.0 – 4.0 tonnes. The chassis, which has been redeveloped from the ground up and tuned in detail, has McPherson front suspension and five different variants of a rigid rear axle, and parabolic springs that are progressive springs in some derivatives. The electromechanical steering is being introduced for the first time in this segment provides steering precision and fine response which VW claims leads to a significant reduction in CO2emissions due to adaptive energy consumption. The further developed EU6 engines based on the Modular Diesel Platform (“MDB”) were specially configured for the new Crafter with respect to the “tough” requirements of a commercial vehicle. The 2-litre TDI engine, the “EA 288 Commercial”, which was further developed for the Crafter, is available with front-wheel drive at three different power output levels for EU6 markets: 75 kW (102 PS), 103 kW (140 PS) or as a BiTurbo TDI with 130 kW (177 PS). The 1,968 cc TDI engine is installed transversely, and it is inclined eight degrees towards the front. Overall, VW claims the engines are 15 per cent per cent more fuel-efficient on average, and scores “with its ruggedness and low wear, maintenance and repair costs, all of which have a positive effect on total cost of ownership (TCO) over the vehicle’s life cycle. Clearly VW, with the new Crafter, is intent on capturing sales from the Mercedes Sprinter. The outgoing Crafter range is produced by Mercedes and all models - both panel vans and chassis-cabs - are identical to their Sprinter rivals, apart from their VW-sourced engines and transmissions. The big question is whether, in the 2.6 to 5.5 tonne gvw sector, VW can now catch up with Mercedes in market share, particularly bearing in mind the Sprinter itself has just gone through a major upgrade. Availability of front-wheel drive (fwd) on the Crafter could be a key selling point, enabling the load platform to be lowered by 200mm or so, making the key-weight 3.5-tonner more of a practical challenger to fwd Ford Transits, Fiat Ducatos, Peugeot-Citroens and Renault-Opel-Nissan-Vauxhalls. Traditionally, in Europe, VW-versus-Mercedes competition in the medium/large van segment, has seen the up-to-3.2 tonnes gvw VW Transporter outsell its Mercedes Vito counterpart by a big margin. 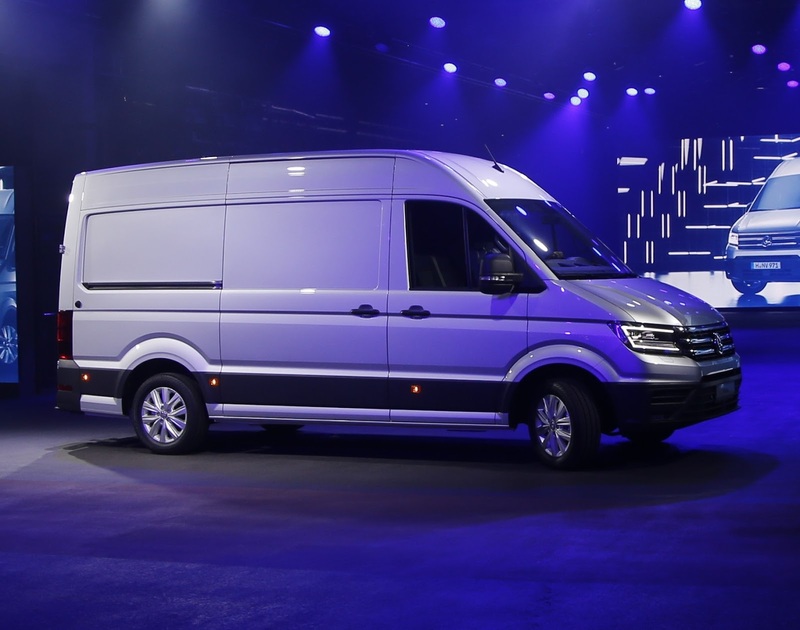 But the Sprinter has dominated the 3.5 tonne-upwards market, seeing off VW’s LT-Crafter. There might not have been exactly a ‘gentleman’s agreement’, but both seemed fairly content with the situation. 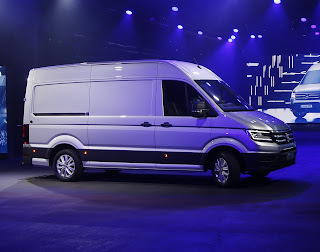 But now, with the new Crafter having zero Mercedes input, the relationship could subtly change, resulting in a fresh marketing ‘putsch’ behind the Vito to win over T5 Transporter buyers. Is platooning just around the corner? Is Troy Clarke about to start smiling?